Classrooms are the place where teachers can share didactic resources with students. In a teacher's portal, the Classrooms allow teachers to see exactly how their course materials will appear to students in their portals. 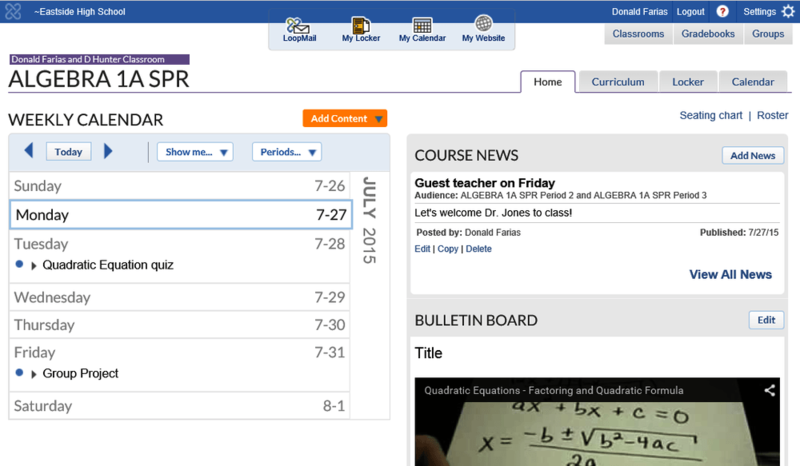 In the portal, click the Classrooms menu at the upper right corner of the screen. A list of all classes will appear. In the Course Management section of the portal homepage, click the name of your class. Current course content (units, lessons, and assignments) is displayed on the Weekly Calendar. The Bulletin Board displays course-related information. All of the units, lessons, and assignments that a teacher has saved or published for the school year show up in this tab. Share files and links appear in the course locker. All assignments and events for the course.